About Bohn Refrigeration - The Bohn tradition of excellence spans 50 years. Since the beginning, we've been the standard against which all other commercial refrigeration brands are measured. Today, Bohn is raising the bar again with an unmatched selection of precisely engineered systems and components, custom designed for supermarket, grocery and other in-store applications. 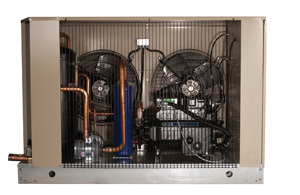 Whether you're looking to upgrade your current system, replace old equipment or start from the ground up, you can count on Bohn products to perform quietly, save energy and lower your operating costs. Only Bohn brings you efficient and environmentally sound cooling innovation, backed by world-class service and technical support. 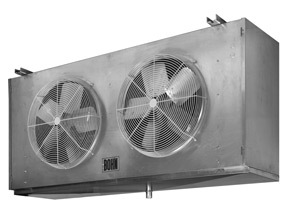 Introducing Monarch and Ambassador Series air cooled condensers - Improved energy efficiency and low sound levels are rapidly becoming key features sought by the Supermarket and Grocery industry. Traditional condensers using 1140 RPM motors offer high capacities, but cannot meet the low sound and energy efficiency standards demanded today by this industry. Now, Bohn brings the best of both worlds together with advanced solutions that offer the high capacities needed for operation while meeting the low sound and energy efficiency requirements you demand. The Bohn Monarch Series with EC motor technology offers all the benefits of variable speed motors without the complexity. EC motors utilize variable speed technology, optimizing fan speeds for load requirements, maximizing energy efficiency and minimizing sound. Offered for the Ambassador Series, Bohn's patented QuietEdge technology uses specially designed swept fan blades to reduce noise levels. These blades are uniquely designed for each motor speed, optimizing performance and ensuring you're receiving the lowest sound levels possible. Look for the QuietEdge 4 blade on the 540 RPM motors and the QuietEdge 5 on the 830 RPM motors. Learn More. New Hot Gas Defrost Refrigeration System - The hot gas defrost line is a new generation of refrigeration system that utilizes hot gas to greatly reduce defrost times and operate in all outdoor ambient temperatures. This leads to increased energy efficiency and product integrity in a refrigeration system that can be used in a greater variety of environmental conditions. This system utilizes a state-of-the-art electronic controller with a proprietary control scheme that allows the system to operate at its most optimal level. Available in March, 2006.